o I saw in my dream that they walked on in their way, and had the weather very comfortable to them. 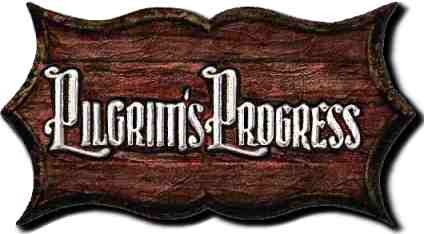 hus now, when they had talked away a little more time, they drew nigh to a house which stood in the way, which house was built for the relief of pilgrims; as you will find more fully related in the first part of these records of the "Pilgrim's Progress." So they drew on towards the house (the house of the INTERPRETER); and when they came to the door, they heard a great talk in the house. They then gave ear, and heard, as they thought, CHRISTIANA mentioned by name; for you must know that there went along, even before her, a talk of her and her children's going on pilgrimage: and this thing was the more pleasing to them, because they had heard that she was CHRISTIAN'S wife--that woman who was some time ago so unwilling to hear of going on pilgrimage. Thus, therefore, they stood still; and heard the good people within commending her who, they little thought, stood at the door. At last CHRISTIANA knocked, as she had done at the gate before. Now when she had knocked, there came to the door a young damsel named INNOCENT, and opened the door, and looked, and behold two women were there. fter awhile--because supper was not ready--the INTERPRETER took them into his significant rooms, and showed them what CHRISTIAN, CHRISTIANA'S husband, had seen some time before. Here, therefore, they saw the man in the cage; the man and his dream; the man that cut his way through his enemies; and the picture of the biggest of them all; together with the rest of those things that were then so profitable to CHRISTIAN. ow supper was ready, the table spread, and all things set on the board. So they sat down, and did eat, when one had given thanks. And the INTERPRETER did usually entertain those that lodged with him with music at meals; so the minstrels played. There was also one that did sing; and a very fine voice he had. Where of I stand in need?. When the song and music were ended, the INTERPRETER asked CHRISTIANA what it was that at first did move her to betake herself to a pilgrim's life? CHRISTIANA answered, "First the loss of my husband came into my mind, at which I was heartily grieved; but all that was but natural affection. Then, after that, came the troubles and pilgrimage of my husband into my mind; and also how like a churl I had carried it to him as to that. So guilt took hold of my mind, and would have drawn me into the pond; but that opportunely I had a dream of the wellbeing of my husband, and a letter sent me by the King of that country where my husband dwells, to come to him. The dream and the letter together so wrought upon my mind, that they forced me to this way." Chris. Yes; a neighbour of mine, one Mrs. TIMOROUS (she was akin to him that would have persuaded my husband to go back for fear of the lions). She all-to-befooled me for--as she called it--my intended desperate adventure. She also urged what she could to dishearten me to it,--the hardship and troubles that my husband met with in the way, but all this I got over pretty well. But a dream that I had, of two ill looking ones, that I thought did plot how to make me miscarry in my journey, that hath troubled me much; yea, it still runs in my mind, and makes me afraid of everyone that I meet, lest they should meet me to do me a mischief, and to turn me out of the way. Yea, I may tell my lord, though I would not have everybody know it, that between this and the gate by which we got into the way, we were both so sorely assaulted, that we were made to cry out "murder": and the two that made this assault upon us were like the two that I saw in my dream. Inter. Then said the INTERPRETER, "Thy beginning is good; thy latter end shall greatly increase." So he addressed himself to MERCY, and said unto her, "And what moved thee to come hither, sweetheart?" Then MERCY blushed and trembled; and for awhile continued silent. Inter. Then said he, "Be not afraid; only believe, and speak thy mind." Mer. So she began, and said, "Truly, sir, my want of experience is that that makes me covet to be in silence; and that also that fills me with fears of coming short at last. I cannot tell of visions and dreams, as my friend CHRISTIANA can; nor know I what it is to mourn for my refusing of the counsel of those that were good relations." Inter. What was it, then, dear heart, that hath prevailed with thee to do as thou hast done? Mer. Why, when our friend here was packing up to be gone from our town, I and another went accidentally to see her; so we knocked at the door and went in. When we were within, and seeing what she was doing, we asked what was her meaning. She said she was sent for to go to her husband; and then she up and told us how she had seen him in a dream, dwelling in a curious place among immortals, wearing a crown, playing upon a harp, eating and drinking at his Prince's table, and singing praises to him for bringing him thither, etc. Now, methought while she was telling these things unto us, my heart burned within me; and I said in my heart, if this be true, I will leave my father and my mother, and the land of my nativity, and will, if I may, go along with CHRISTIANA. So I asked her further of the truth of these things, and if she would let me go with her; for I saw now that there was no dwelling, but with the danger of ruin, any longer in our town. But yet I came away with a heavy heart; not for that I was unwilling to come away, but for that so many of my relations were left behind. And I am come with all the desire of my heart; and will go, if I may, with CHRISTIANA unto her husband and his King. Inter. Thy setting out is good; for thou hast given credit to the truth. Thou art a Ruth; who did, for the love that she bore to Naomi, and to the Lord her God, leave father and mother, and the land of her nativity, to come out, and go with a people that she knew not heretofore. "The Lord recompense thy work; and a full reward be given thee of the Lord God of Israel, under whose wings thou art come to truth". Now supper was ended, and preparation was made for bed; the women were laid singly alone, and the boys by themselves. Now when MERCY was in bed, she could not sleep for joy, for that now her doubts of missing at last were removed farther from her than ever they were before; so she lay blessing and praising God, who had had such favour for her. n the morning they arose with the sun, and prepared themselves for their departure; but the INTERPRETER would have them tarry awhile, "For," said he, "you must orderly go from hence." Then said he to the damsel that at first opened unto them, "Take them, and have them into the garden to the bath; and there wash them, and make them clean from the soil which they have gathered by travelling." Then INNOCENT, the damsel, took them, and had them into the garden, and brought them to the bath; so she told them that there they must wash and be clean, for so her master would have the women to do that called at his house as they were going on pilgrimage. Then they went in and washed, yea, they and the boys and all; and they came out of that bath, not only sweet and clean, but also much enlivened and strengthened in their joints: so when they came in, they looked fairer a deal than when they went out to the washing. and the mark was set between their eyes. This seal greatly added to their beauty, for it was an ornament to their faces; it also added to their gravity, and made their countenances more like those of angels. Then said the INTERPRETER again to the damsel that waited upon these women, "Go into the vestry, and fetch out garments for these people." So she went, and fetched out white raiment, and laid it down before him; so he commanded them to put it on. It was fine linen, white and clean. When the women were thus adorned, they seemed to be a terror one to the other; for that they could not see that glory each one on herself which they could see in each other. Now therefore, they began to esteem each other better than themselves; "For you are fairer than I am," said one; "And you are more comely than I am," said another. The children also stood amazed to see into what fashion they were brought.